We were off to Children's this morning for a scheduled clinic visit with Dr. Cava. Hurray for Braden as he is no longer a "hose nose" (Grandpa Harvey's words). We're officially off of the oxygen, which means no more pulse ox, lugging around an O2 tank, and upsetting our son as he fights putting it on everynight. Speaking of nights, we have been getting more sleep these days. Braden is at that age where we can let him cry a bit before racing into his room to stuff the pacifier back in his mouth. We talked to the docs, and they said it's okay with his heart to let him cry. So, I no longer have that haggard, no-sleep look on my face :-) We also ventured to the 4th floor to visit our friends, the Slagers. They brought Sam back in on Christmas Eve due to his lack of eating. It's still not resolved. Please say a prayer for Sam - we hope they get to celebrate the New Year in the comfort of their home. Venturing to the 4th floor also allowed us to see a few of Braden's favorite nurses. He flashed a few smiles to remind them of his charm. On our way out, we were greeted by Dr. Ghanayem and slightly scolded for not letting her know we were at CHW. She commented on how "pink" Braden looked. She was the 3rd person to tell us that today - makes us feel so good. Oh, and I almost forgot to mention....we don't have to go back to clinic for another 2 months - woo-hoo! Well, since I'm up and writing I might as well continue with other happenings. We celebrated Christmas Day at Rich's Aunt Peg and Uncle Ray's. It was so good to see everyone as we've lived the "bubble" life for too long. Braden was a bit over-stimulated to say the least, and fussed and slept most of the time. It's expected when we introduce him to the ENTIRE family at once :-) Hopefully this spring we can venture up to the U.P. to meet all of my family. Today marks a week until I return to work. My school has been amazingly understanding with the situation regarding Braden's health. I have had the privilege of spending all of this time with him at home (and the hospital). I was granted an extension of leave (the month of December) to care for him after his Glenn - I am forever grateful for this time. As I close, I want to say that along our journey we have met and corresponded with so many families who have walked in our shoes and who continue to do so. It has been a network of people whom I've confided in and has allowed me to untangle some of those chaotic, stressful moments. It's amazing how differently you look at life when it's been touched by so many wonderful people. PS....for all of the obsessive blog-aholics (you know who you are), I "snuck" this post in on you. Regular scheduled posts will be on Sunday evenings due to popular demand. Things are continuing to go well here at the Petska household. We are enjoying every moment with Braden as he's growing, learning, and changing each day. 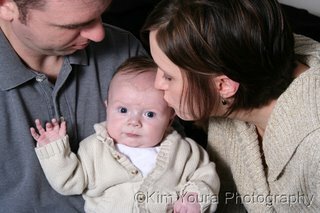 I'm posting this pic as it is one of my favorites of us as a new family. This holiday season we look back and reflect on the "gifts" we have been blessed with this year. 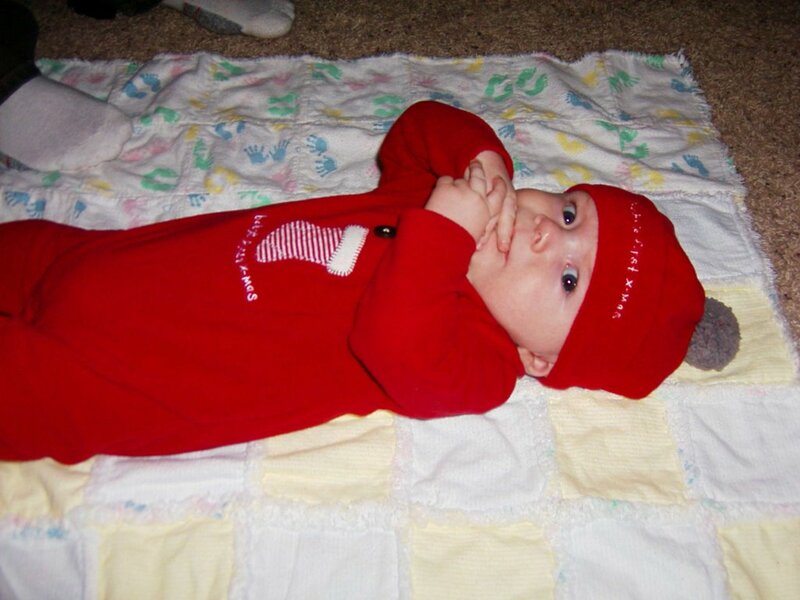 I see all of these gifts wrapped up in one little package when I look at Braden's sweet face. He is our hero, our strength, and proudly our son. Our lives have forever changed since we've been blessed with this special, little gift. We hold him close and cherish this first Christmas with him, spent in the comfort of our home. May you find special gifts that surround you each and everyday. Happy Holidays! Braden had a follow-up clinic appt. with Dr. Cava, his cardiologist, today. Grandma Lois came with to help out. There weren't a whole lot of changes made. He's still on the meds he was sent home on and of course, the oxygen. Although his sats have improved, Dr. Cava wasn't overly impressed to the point of getting rid of it just yet. We will go back in a few weeks for another clinic appt. If his O2 sats still aren't where they should be, we may need to adjust some meds....we shall see :-) After our clinic appt. we were able to visit our friends, the Slagers, who are the parents of Sam (Braden's former room-mate from his 1st surgery). Sam is continuing to recover from his surgery in the PICU. We continue to pray for him and his parents. That's really about all. Braden has done well adjusting back to our quiet home life. 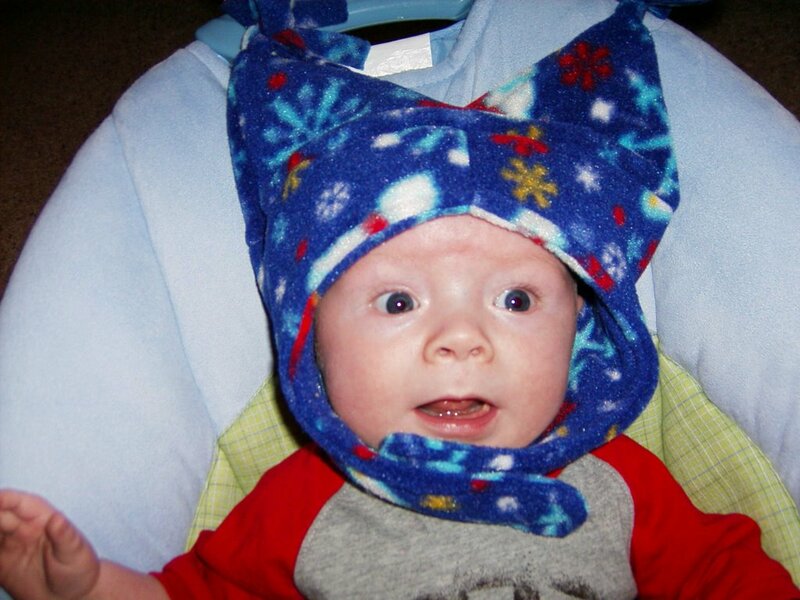 The attached pics are of us going home from CHW and a pic I took today of Braden and his new winter hat (compliments of Aunt Barb, Uncle Mark, Nat, Andrew & Trevor). We couldn't be more excited to be GOING HOME!!!! We were given the okay from Dr. Cava and Dr. Ghanayem. We will be returning for clinic visits (hopefully that's all until the fontan surgery). We were also told we can "pop" the bubble we've been living in. We still have to be very cautious with visitors and where we take Braden, but it's nice to know we can leave the house for reasons other than doctor visits :-) We will be going home on 4 meds (1 being aspirin), but they will ween us off of 2 through clinic. We will also be going home on 1/4 liter of oxygen. We're not too concerned.....he'll be weened off of that through clinic as well. We won't have to weigh him everyday, document his amount of intake, output, or obsess about his O2 saturation.....phew! We can't thank you all enough for all of your support. We once again witnessed the power of prayer. Thank you for allowing us to lean on you through this past week. PS.....don't worry blog-aholics, we'll continue to post here and there with updates and of course, pictures!!! Rounds came and went, and well.....we're still here :-( The cardiologist on staff wants to see Braden's sats come up before they send us home. He would also like to see us go home without oxygen. During rounds, the cardiologist was rubbing Braden's head and said (optimistically), "Maybe we'll send them home this weekend." Rich said the look on my face was indescribable. As I picked my chin up off the floor, I just happened to mention that we thought we were going home TODAY!!! Like I mentioned previously, his reasoning was behind Braden's cranky sats (mid to upper 70's) and still being on O2. Braden's cardiologist, Dr. Cava, hasn't been up to see us yet though. He mentioned the other day that it might be okay to go home on oxygen. I guess we'll let the docs duke it out on when we can leave :-) We're slightly disappointed, but if that's the only reason keeping us here, I guess we can't complain. Braden is doing great...he's sleeping right now. He had a good night, and all of his nurses can't get over how happy he is :-) We will find out in rounds today if we're going home. He'll be going down to get a chest x-ray (making sure there's no fluid build up after the chest tubes were pulled) in a bit. If that's all clear, we should be able to go home. He still hasn't been completely weened from the O2, but we can ween that at home. I guess this happens sometimes where the lungs have to get used to the new route of blood flow. 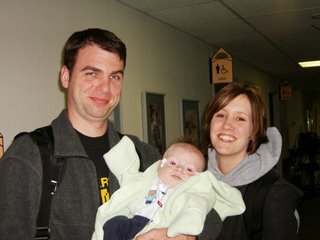 We're fine with going home with O2, especially since Braden was on it just before his surgery. We have taken comfort in your support. Thank you. We've been moved up to the 4th floor and out of the PICU!! We were supposed to be up here yesterday, but they are packed up here and didn't have a bed for him. All Braden is on now is an O2 nose tube, and one IV in his wrist. The IV is not being used for anything right now, they still have it in incase there was an emergency and they needed to administer a med. We had a great day with him yesterday and so did the nurses in the PICU. Different people kept stopping in to see "the happiest baby in the PICU" and he would give everyone his big smiles. After we fed him at 9 he was so happy and smiling away at us as we played with him and his toys. We even got our first giggles out of him. They were pretty cute. Between 930 and 1130 last night was a different story though. He got the hiccups (probably from the giggles) and was very uncomfortable then due to his sore chest. It didn't look like fun. Thursday looks like a good target day for going home at this point. We will see how the next couple of chest x-rays look and if he does well when he starts to wean of his O2. One doctor is pushing for tomorrow and going home on oxygen, which wouldn't be a big deal to us as long as we go home. Just thought I'd drop a quick line on my coffee break. Braden is still in the PICU but only because there's no room available for him on the 4th floor. He's eating well, and Dr. Ghanayem's magic prune juice worked a little too well for him....dad was lucky and missed out on that diaper change :-) His echo came back a-ok, and the doctors were very pleased with his Glenn site (the new area of blood flow to the lungs). If things continue to go well, it looks like we could skate on out of here by Wednesday! His doctors would like to see him completely weened off of the O2 before we leave. Samuel update: Sam is out of surgery, and it sounds like everything went well. Thank you for helping him out with your prayers. Prayer Request: Braden's old roommate, Sam, is having open-heart surgery today. We ask if you could keep Sam and his mom & dad in your prayers today as well. Thanks! Thanks for surrounding us with your prayers and positive thoughts. Progress is still great. His O2 sats have been at their best today (mid 80's) since surgery. He's still on 1/2 a liter of oxygen, but with his sats improving as they ween the O2, he should be on room air in no time! His heart rate is looking great as well. We've seen lots of big smiles from our lil' man today :-) Also, his chest tube drainage has been close to nothing today, so hopefully those chest tubes come out tomorrow!!! The power of prayer = amazing!!!! We know that God's healing hands are wrapped around Braden. Thank you for keeping us in your prayers. Well, it looks as if the med we had been giving him at home that they were continuing here is causing his heart rate to be lower than where they'd like it to be. The med was administered originally to mellow out his heart rate when he got stressed. They will ween him off of the med now, but in the mean time he will have to be paced for a bit. Being on a pacer will keep us in the PICU another day....oh darn! They even had a room waiting for us upstairs. We'll post later today with any updates. Rich and I are holding up pretty well. Although it was harder this time to let him go, it feels a little less stressful now that we know the routine and most of the hospital lingo involved. I'm thinking most of you are reading this from home as mother nature has helped shut down most of Southeastern WI and Northern Illinois. RMH has served yet another purpose :-) We could barely get out of the RMH parking lot to get across the street this morning. Thanks for checking in. We will try to post later today/tonight with another update. Thanks for continuing to surround us with your prayers and positive thoughts. Happy snowstorm to everyone at home! Braden is still doing well. He is going to get some of his chest draining tubes pulled out today and a couple of the IV's out also. They were kind of waiting for the doctors to round before they could feed him(incase they had to pull the tubes), so he was pretty cranky and fired up. He is getting a bottle now and they are going to start yanking stuff in a couple of hours. Even when he was crying we got a little smile today. So we know he is getting better. We will keep you posted throughout the day. Those of you that are homebound today will have something to do then! !